See herbalism for the non-Chinese tradition of herbology. Chinese herbology or Chinese materia medica (Simplified Chinese: 中药学; Traditional Chinese: 中藥學; pinyin: Zhōngyào xué), the Chinese art of combining medicinal herbs, is an important aspect of traditional Chinese medicine. Crude medicines (naturally occurring unrefined substances intended for medical use) and prepared drugs (Simplified Chinese: 饮片; Traditional Chinese: 飲片; pinyin: yǐnpiàn) are used in combinations to treat patients according to traditional Chinese medical theory. 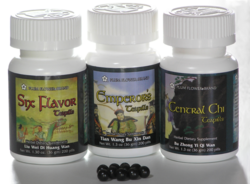 Each herbal medicine prescription is a tailored to the individual patient and includes one or two main ingredients that target the illness, plus additional ingredients to adjust the formula to the particular patient's balance of yin/yang. Unlike in the production of Western medications, the balance and interaction of all the ingredients in a Chinese herbal prescription is considered more important than the effects of the individual ingredients. Chinese herbology incorporates ingredients from all parts of plants, including the roots, leaves, stems, flowers, and fruits, and also ingredients from animals and minerals. The Divine Farmer's Herb-Root Classic (Traditional Chinese: 神農本草經; Simplified Chinese: 神农本草经; pinyin: Shénnóng běncǎo jīng), first compiled around 206 B.C.E. and attributed to Shennong, a legendary ruler of China who is believed to have taught ancient China the practices of agriculture, includes 365 medicines. During the Neo-Confucian Song-Jin-Yuan era (tenth to twelfth centuries), the theories of the Five Phases (Tastes) and the Twelve Channels (Meridians) were applied to herbology. The Compendium of Materia Medica (Ben Cao Gangmu) compiled during the Ming dynasty by Li Shizhen (1518 – 1593), is still used today for consultation and reference. It lists 1,892 distinct herbs, and about 11,096 prescriptions to treat common illnesses. Chinese herbology is the Chinese art of combining medicinal herbs. Herbology is one of the more important aspects of traditional Chinese medicine (TCM). Each herbal medicine prescription is a cocktail of many herbs tailored to the individual patient and based on traditional Chinese medical theory. One batch of herbs is typically decocted twice over the course of one hour. The practitioner usually designs a remedy using one or two main ingredients that target the illness, then adds many additional ingredients to adjust the formula to the particular patient's yin/yang conditions. Sometimes, ingredients are needed to cancel out toxicity or side-effects of the main ingredients. Some herbs require the use of other ingredients as catalysts, without which the brew is ineffective. Unlike in the production of western medications, the balance and interaction of all the ingredients in a Chinese herbal prescription is considered more important than the effects of the individual ingredients. A crucial element in traditional Chinese medicine is the treatment of each patient as an individual. Chinese herbology often incorporates ingredients from all parts of plants, including the roots, leaves, stems, flowers, and fruits, and also ingredients from animals and minerals. The use of parts of endangered species (such as seahorses, rhinoceros horns, and tiger bones) has created controversy and resulted in a black market of poachers who hunt restricted animals. Many herbal manufacturers have discontinued the use of any parts from endangered animals. The history of Chinese Medicine begins with the Yellow Emperors Inner Classic (Huang Di Nei Jing), a dialogue between the Yellow Emperor (2697-2597 B.C.E.) and his physician Qi Bo, in which they discuss many aspects of Chinese medicine, including acupuncture, yin-yang theory, Five Elements pathology, diagnosis, and etiology of disease. The Inner Classic was compiled around 305-204 B.C.E. and is the foundation for the theory and philosophy of traditional Chinese medicine. The first Chinese manual on pharmacology, the Shennong Bencao Jing (Shennong Emperor's Classic of Materia Medica), lists some 365 medicines of which 252 are herbs, and dates from the first century C.E. Han dynasty. Earlier literature included lists of prescriptions for specific ailments, exemplified by a manuscript "Recipes for 52 Ailments," found in the MaWangDui tomb, sealed in 168 B.C.E. Chinese herbal medicine is a compilation of experimentation and research dating back to a tribal chief named Shennong, who resided in China along the great Yellow River Plateau (2700 B.C.E.). Shennong (Traditional Chinese: 神農; Simplified Chinese: 神农; pinyin: Shénnóng), also known as the Yan Emperor (炎帝) or the Emperor of the Five Grains (Traditional Chinese: 五穀先帝; Simplified Chinese: 五谷先帝; pinyin: Wǔgǔ xiāndì), was a legendary ruler of China and cultural hero of Chinese mythology who is believed to have lived along the great Yellow River Plateau some 5,000 years ago, and taught ancient China the practices of agriculture. Appropriately, his name means "the Divine Farmer." Considered the father of Chinese agriculture, this legendary emperor taught his people how to cultivate grains as food, so as to avoid killing animals. He is said to have tasted hundreds of herbs to test their medical value. The most well-known work attributed to Shennong is the The Divine Farmer's Herb-Root Classic (Traditional Chinese: 神農本草經; Simplified Chinese: 神农本草经; pinyin: Shénnóng běncǎo jīng), first compiled around 206 B.C.E., during the end of the Western Han Dynasty, several thousand years after Shennong existed. It lists various medical herbs, such as reishi, which were discovered by Shennong and given grade and rarity ratings. This work is considered to be the earliest Chinese pharmacopoeia. It includes 365 medicines derived from minerals, plants, and animals. Shennong is credited with identifying hundreds of medical (and poisonous) herbs by personally testing their properties. He is also said to have discovered tea, which acts as an antidote against the poisonous effects of some seventy herbs. Chinese legend places this discovery in 2737 B.C.E., when Shennong first tasted tea made from leaves of burning twigs of the tea plant, which were carried up from the fire by the hot air, and landed in his cauldron of boiling water. Shennong is venerated as the Father of Chinese medicine. He is also believed to have introduced the technique of acupuncture. Zhang Zhong Jing, a celebrated Chinese physician who lived around the third century B.C.E., compiled two classics, Shang Han Lun (Discussion of Cold Induced disease) and Jin Gui Yao Lun, (Synopsis of Prescriptions of the Golden Chamber). These works are still referenced today for medical diagnosis, treatment, and the differentiation of yin-yang and the six stages. Around 452 C.E. a Daoist named Tao Hong Jing edited the original Classics of Materia Medica according to kingdom, plant, animal, or mineral. He also increased the total number of entries to 730 substances. Succeeding generations added to this work with new treatises, such as the seventh-century Tang dynasty Yaoxing Lun (藥性論; also spelled Yao Xing Lun, "Treatise on the Nature of Medicinal Herbs"). During the Sung Dynasty (960-1279 C.E. ), a physician named Tang Shen Wei increased the Materia Medica to 1746 substances. The Compendium of Materia Medica (Ben Cao Gangmu) compiled during the Ming dynasty by Li Shizhen (1518 – 1593), is still used today for consultation and reference. Li Shizhen read eight hundred medical works and conducted thirty years of research. The work consists of 884 pages in 52 volumes and contains 1,160 illustrations. The work lists 1,892 distinct herbs, of which 374 were added by Li himself. There are about 11,096 prescriptions to treat common illness, 8,160 of which were compounded or collected by Li. For every herb there are entries on names, detailed description of appearance and odor, nature, medical function, effects and prescriptions. During the Neo-Confucian Song-Jin-Yuan era (tenth to twelfth centuries), the theoretical framework of acupuncture theory, which was rooted in Han Confucian theory, was formally applied to herbal categorization, which had previously been the domain of Daoist natural science. In particular, the theories of the Five Phases (Tastes) and the Twelve Channels (Energy Meridians) came to be used after this period. The Four Natures theory pertains to the degree of yin and yang, cold (extreme yin), cool, neutral, warm and hot (extreme yang). The patient's internal balance of yin and yang is taken into account when the herbs are selected. For example, medicinal herbs of "hot," yang nature are used when the person is suffering from internal cold that requires to be purged, or when the patient has a general cold constituency. Sometimes an ingredient is added to offset the extreme effect of one herb. The "five tastes" are pungent, sweet, sour, bitter and salty, each of which has its functions and characteristics. For example, pungent herbs are used to generate sweat and to direct and vitalize qi and the blood. Sweet-tasting herbs often tone or harmonize bodily systems. Some sweet-tasting herbs also exhibit a bland taste, which helps drain dampness through diuresis. Pungent herbs stimulate, warm, raise qi from the interior to the exterior. Sour taste most often is astringent and consolidates qi and secretions, while bitter herbs drain qi downward, dispel heat, purge the bowels and get rid of dampness by drying them out. Salty tastes soften hard masses as well as purge and open the bowels. Pungent herbs strengthen the lungs and large intestine, sweet herbs harmonize the spleen and stomach, sour herbs nourish the liver and gallbladder, and bitter herbs strengthen the heart and small intestine. The Meridians refer to currents of energy which flow through different organs and parts of the body. Certain herbs are linked with specific meridians and therefore act upon the organs associated with them. For example, menthol is pungent, cool and is linked with the lungs and the liver. Since the lungs are the organ which protects the body from the invasion of colds and influenza, menthol can help purge invading heat toxins caused by hot "wind." Characteristic little black pills of Chinese patent medicine. Chinese patent medicine (traditional Chinese: 中成藥, Simplified Chinese: 中成药, pinyin: zhōng chéng yào) are standardized herbal formulas. Several herbs and other ingredients are dried and ground, then mixed into a powder and formed into pills. The binder is traditionally honey. The pills are characteristically small, round and black. Chinese patent medicines are easy and convenient, but are not easy to customize for a particular patient. They are best used when a patient's condition is not severe and the medicine can be taken as a long-term treatment. These medicines are not "patented" in the traditional sense of the word. No one has exclusive rights to the formula. Instead, "patent" refers to the standardization of the formula. All Chinese patent medicines of the same name will have the same proportions of ingredients. Herbalism, for the use of medicinal herbs in other traditions. ↑ Jane Reynolds, Phil Gates, and Gaden Robinson. 365 Days of Nature and Discovery (New York: Harry N. Adams, Inc., 1994, ISBN 0-8109-3876-6). ↑ Chinese Herbology, Scott Suvow, L.Ac. Retrieved December 12, 2007. ↑ Rehmannia glutinosa, Plants For A Future: Database Search Results. Retrieved December 12, 2007. Li, Chen-Pien. 1974. Chinese herbal medicine. Washington: U.S. Dept. of Health, Education, and Welfare, Public Health Service, National Institutes of Health. Reynolds, Jane, Phil Gates, and Gaden Robinson. 1994. 365 Days of Nature and Discovery. Harry N. Adams, Inc., New York. ISBN 0-8109-3876-6. Wong, Ming. 1976. La médecine chinoise par les plantes. Paris, Tchou.T. Herbs - A comprehensive listing of Chinese herbs grouped by their action. This page was last modified on 13 February 2017, at 17:26.